The Agriculture Ministry on Thursday announced a TK 40.18 crore incentive for the farmers of 64 districts for cultivating ‘Ufshi’ variety of Aush crops. 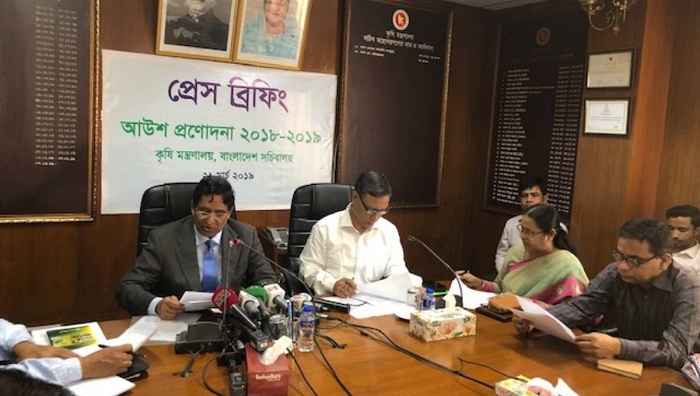 Agriculture Minister Dr Md Abdur Razzaque made the announcement at a press briefing at the secretariat. Under the package, 4, 59,226 farmers will be given seeds and fertilizer to cultivate 61,353,81 hetares of land in this season spending Tk 40.18 crore. Each farmer will be provided with 5 kg seed, 15kg DSP fertilizer, 10kg MOP fertilizer, Tk 90 for transport cost and other costs Tk 20 for cultivating each bigha land. Farmers will get 1, 56,452 metric tonnes of Aush paddy using the government incentives, he hoped.